The 2018 NBA Draft was one of the most loaded talent-wise in recent memory. 52 out of 60 draft picks made their NBA debut in 2018-19 to varying degrees of impact, with some providing immediate production to their new teams. While the first 10 picks were mostly fine, if the top 10 was redrafted today it would look a lot different. Here is how the top 10 would likely shake out if redrafted today. 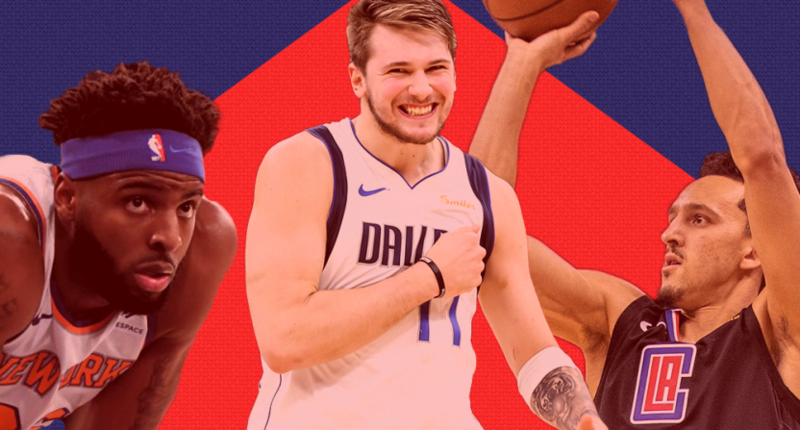 Doncic turned in an outstanding rookie campaign for the Dallas Mavericks after being drafted third overall by the Atlanta Hawks and traded to Dallas in the Trae Young deal. Doncic had no problem transitioning from the EuroLeague to the NBA as a teenager. He was the Mavericks’ best player from day one. Doncic’s crafty offensive skill set allowed him to score in a variety of ways. He consistently found teammates by drawing defenders in and making heads up, difficulty passes. In his first season, Doncic led rookies with 21.2 points, while adding 7.7 rebounds and 5.9 assists per game. He will be the NBA’s Rookie of the Year. Ayton was a fine pick at number one, but at this point, Doncic would seem like a no-brainer first pick with a do-over. Young struggled early in 2018-19, as the Oklahoma sharpshooter made just 19.8 percent of his three-point attempts in November. However, as the season progressed, Young delivered on the potential that made him the fifth overall pick. Despite being relatively undersized at 6’2″ and being a non-factor on the defensive end, Young’s offensive game blossomed as the season went on. Scoring-wise, he broke out after the slow start, averaging 23.3 points from February onwards while hitting multiple clutch shots for the Hawks. In 80 games, he averaged 19.1 points, 8.0 assists, and 3.7 rebounds per game while shooting 32 percent from the field. Young also proved to be the best passer in this draft class, as he routinely found open teammates with nifty passes. Young will be even better next season now he has found his confidence. Ayton mostly lived up to the hype of being the first overall pick and would still be a top three pick of the class was redrafted, even if he doesn’t currently look like the best player from that class. In his first season in Phoenix, Ayton was exactly as advertised. He was an efficient scorer in the post with a little bit of range who was a plus-rebounder. Unfortunately, the Suns were a disaster and didn’t help Ayton evolve beyond expectations. He didn’t shoot three-pointers despite hitting 34 percent from long range at Arizona, and he didn’t have a starter-level point guard to help him at any point in the season. He still managed to average a double-double, posting 16.3 points and 10.3 rebounds per game. As Phoenix’s roster improves, so will Ayton. Jackson Jr. turned out to be the perfect selection for the Grizzlies. As a rookie, the 19-year-old was the young building block Memphis has lacked. At 6’11”, Jackson Jr. used his 7’5″ wingspan to be a plus defender from the get-go. He read defenses easily for his age, defended multiple positions well, was extremely active on both ends, and was a great shot blocker at the rim. As a rookie, Jackson Jr. fouled too much, but once he can control his body, he will challenge for the Defensive Player of the Year award. Offensively, he was solid, averaging 13.8 points per game on 50.6 percent shooting from the field and 35.9 percent from three-point range. There is a lot to like about his game. Drafted second overall, Bagley III was an impactful player for a surprisingly good Sacramento Kings team and did nothing to hurt his status as a future All-Star. In 2018-19, Bagley III came off the bench almost exclusively for the Kings. Despite not starting, he still transitioned well to the faster NBA game, averaging 14.8 points, 7.6 rebounds, and 1.0 blocks per game. The former Duke star was an extremely active offensive rebounder who used his exceptional athleticism to provide an immediate spark for Sacramento. He was an explosive finisher at the rim. Bagley will likely transition to a starting role next season, and he has earned it. Alongside De’Aaron Fox, Buddy Hield and Bogdan Bogdanovic, the Kings future has not looked this bright in over a decade. Sexton’s rookie season started as rough as possible. In November, unnamed Cavaliers veterans blamed Sexton (and other younger players) for not “knowing their role, or knowing how to win, or what to do on the court.” Sexton struggled out of the gate, and many wrote off his potential. But over the full season, he has proven doubters wrong. Sexton will never be a good passer. He averaged just 2.9 assists per game, which is a shockingly low number for a starting point guard. But, Sexton was never advertised as a great passer. He has proven to be an efficient scorer, however, averaging 16.7 points per game, while shooting 40.8 percent from beyond the arc. His passing needs to improve, but Sexton can score at the NBA level and do it in bunches. Give him some quality teammates and nobody will be questioning his ability. The Clippers got tremendous value drafting Gilgeous-Alexander with the 11th overall pick. The former Kentucky point guard has helped elevate them to a surprise playoff team in 2018-19. Gilgeous-Alexander did not look out of place while starting 72 of 81 games for the Clippers. At 6’6″ with a 7-foot wingspan, he has got the perfect frame for a point guard in the modern NBA. He is a capable defender, a good three-point shooter and a great finisher at the rim. He has averaged 10.9 points, 3.3 assists, and 2.9 rebounds while shooting 36.7 percent from three and 47.6 percent from the field. Gilgeous-Alexander has gotten better as the season progressed and played a notable part in the Clippers’ run to the postseason. After a three-year run at Witchita State, the Philadelphia 76ers took Shamet with the 26th overall pick. Despite getting traded to the Clippers in the blockbuster Tobias Harris deal, Shamet has done nothing but score since going pro. In 78 games split between Philly and Los Angeles, Shamet is 14th in the entire NBA in three-point field goal percentage with an impressive 42 percent make rate from deep. Since joining the Clippers, he has been on fire from three, shooting a ridiculous 45 percent on 6.0 attempts per game. Alongside Gilgeous-Alexander, Shamet has been a part of an exciting rookie backcourt. He has turned in a superb, somewhat unexpected rookie performance. On potential alone, Carter Jr., the seventh overall pick in 2018, might be ranked too low on this list. However, injuries have impacted the talented center’s rookie impact. At 19, Carter Jr. showed some intriguing ability as a rookie. In 44 games before going down with a thumb injury, Carter Jr. averaged 10.3 points, 7.0 rebounds, 1.8 assists and 1.3 blocks per game. The 6’10” center was a plus shot blocker thanks to his 7’3″ wingspan. Carter Jr. also proved to have a high motor and proved to be a tenacious offensive rebounder while showing a nice passing ability for a big. While he is not a great shooter, Carter Jr. is a nice fit alongside franchise star Lauri Markkanen. It will be interesting to see where his development takes him because Carter Jr. has got a chance to be a really good NBA player for a long time. Ignoring the fact he claims to have never heard of Hall of Famer Hakeem Olajuwon (who praised him), Robinson was the best second-round choice of this class after the Knicks took him 36th overall. As a rookie, Robinson finished second in the NBA in blocks with 2.47 per game – a 36 minute average of 4.4 blocks per game. Robinson is an athletic monster whose shot blocking made a terrible Knicks squad worth watching. While he did not score a high clip, averaging just 7.3 points in 20.3 minutes per game, Robinson shot 69 percent from the field – which would lead the NBA if he qualified. In 64 games (17 starts), the 21-year-old did so many things well on the court that it was hard to ignore. The Knicks should be thrilled with his development and impact.